Registration is now open for one of Chattanooga’s most popular trail running events of the season, the Scenic City Trail Marathon & 1/2 Marathon. 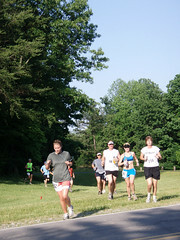 The events, taking place on May 23rd, are part of the Rock/Creek Trail Series and the 2009 Vasque PROJECT. The race weekend will also consist of an athlete clinic and a fundraiser for the Wilderness Trail Running Association, (aka The Boonies). To register for the race or for more details about the clinic, Rock/Creek, or the Boonies, please visit https://www.rockcreek.com/trailmarathon/. The Vasque PROJECT 2009 is a nationwide effort to foster competition, community, and environmental stewardship through Vasque’s sponsorship of trail‐running events throughout the U.S. and Canada. The PROJECT includes 45 trail races in 12 states. Major races and race series include the Great Eastern Series in Charlottesville, VA, the Rock/Creek Trail Series in Chattanooga, TN, the Great Lakes Endurance Series in Northern, MI, the Golden Leaf Half Marathon in Aspen, CO, the Cougar Trail Series in Seattle, WA, the Rogue Trail Series in Austin, TX, the Fast Trax Trail Series in Edmonton, Alberta, the DINO Trail Series in Indianapolis, IN, Peter’s Canyon Trail Series in Irvine, CA, the Grand Teton Races in Jackson Hole, WY, the River City Ramble in Red Wing, MN, and the Triple Lakes Races in Greensboro, NC. For more information about Vasque PROJECT 2009, or for details on products and retailers, visit www.vasque.com. Rock/Creek, member of the Grassroots Outdoor Alliance, is an independent specialty outdoor retailer based in Chattanooga, TN. Rock/Creek was named 2009 Online Retailer of the Year by Backpacker Magazine and SNEWS and was listed as a Top 25 Retailer by Outdoor Business for 2008 and 2009. Along with its online shops, RockCreek.com and ClimbingGear.com, Rock/Creek provides quality outdoor clothing and gear for a host of activities including kayaking, rock climbing, camping, hiking, trail running, and adventure racing. Rock/Creek is committed to making a positive impact on the environment. For this reason, it uses outdoor retail as a platform to encourage outdoor recreation and environmental stewardship and to improve public access to the backcountry. Rock/Creek supports worthy nonprofits such as the Southeastern Climbers’ Coalition and the Wilderness Trail Running Association. For related articles on Rock/Creek,visit www.rockcreek.com/media/.